I hope my break was enough. My first day back to work was tough. I hated it. I was ready to give it all up. 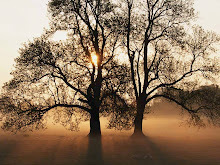 I have a long list of misgivings about work and at the very top is not feeling good enough. There is so much I don't know... Hence the $500 continuing education conference I'm dishing out for this coming weekend. I would rather not eat to be able to gain some new skills and knoweldge. Fortunately, my second day of work was better... I realized, maybe I do know a thing or too, after being frustrated with what my substitute did or did not do for/with my patients. And I was gone long enough for my wrist to heal. That is my second concern- if I already have work injuries... I can't treat patients this much for long... Okay- enough on that subject. All I know is that for now- stay put. (and hopefully that will change soon). I feel like I am rambling. So to put an end to it all -a memory from my trip in the form of a picture. 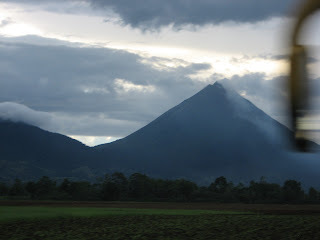 My favorite part of our trip- Arenal. So this is a picture of my first view of the volcano. And yes, that is smoke coming out the top.